Acute pancreatitis is an inflammation of the pancreas that typically causes very sudden and very severe upper abdominal pain. It is most commonly caused by gallstones or drinking too much alcohol. The acute inflammation usually clears up within one to two weeks. But it may also lead to complications and other illnesses. Treatment may then take several months. Pancreatitis is treated in a hospital because the complications can sometimes become life-threatening. Acute pancreatitis almost always causes severe upper abdominal pain. The pain can spread to your back and is usually accompanied by nausea and vomiting. Other common symptoms include fever, a bloated stomach and feeling weak. The pain is usually sudden and so severe that most people go straight to a doctor. They typically go to a hospital the same day. Gallstones are the most common cause of acute pancreatitis. The pancreas produces digestive juices that flow into the duodenum (the first section of the small intestine) through a tube called the pancreatic duct. Just before the pancreatic duct reaches the duodenum, it is joined by the common bile duct. The two ducts share one opening into the duodenum, known as the ampulla of Vater. The common bile duct transports a fluid called bile from the gallbladder and liver to the duodenum. If gallstones form and enter the common bile duct, they may end up blocking the shared opening. 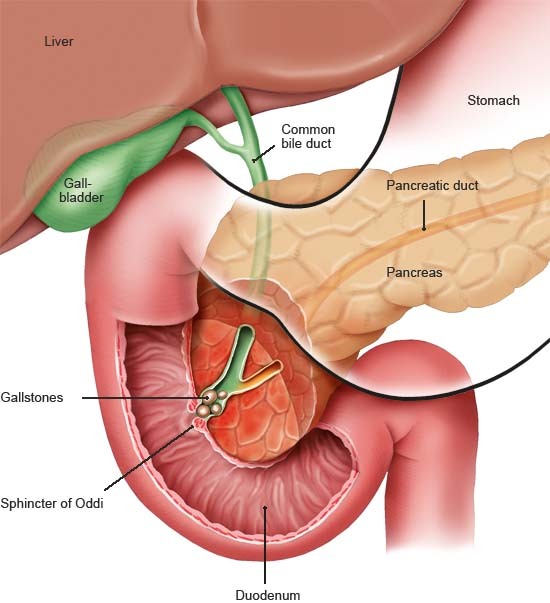 As a result, the bile and pancreatic juices can't flow out into the duodenum and they start to build up. Experts believe that it is this blockage that causes the pancreas to become inflamed. The second most common cause of pancreatitis is drinking too much alcohol. It is still not known exactly how alcohol causes pancreatitis, but the link has been observed in many studies. Other factors that can increase the likelihood of pancreatitis include a narrowing of the bile duct and high levels of specific fats (triglycerides) or calcium in the bloodstream. Acute pancreatitis is sometimes also caused by medications or a viral infection. Surgery on the gallbladder or bile ducts can cause pancreatitis too, but only in very rare cases. No clear cause is found in as many as 10 out of 100 cases of pancreatitis. In Germany, about 56,000 people are treated at a hospital for acute pancreatitis every year. That's about 70 out of every 100,000 people. Most people who develop pancreatitis are over the age of 45. It is somewhat more common in men than in women. The course of pancreatitis can vary quite a bit depending on how severe the inflammation is and how badly it damages the tissue. About 80% of people who receive treatment for acute pancreatitis recover within about one to two weeks. More serious complications occur in about 20% of cases. It can then take weeks or even months to get better again. Overall, about 3% of people who develop acute pancreatitis die of complications. If caused by gallstones, pancreatitis often occurs again. Doctors then recommend removing the gallbladder to prevent this from happening. Pseudocysts are a common complication of acute pancreatitis. These digestive-juice-filled sacs may develop on the pancreas several weeks after the inflammation arises. Pseudocysts often remain small and go undetected, but they sometimes become so large that they cause problems like indigestion or bloating. Larger pseudocysts are also more likely to tear open and bleed or cause an infection. A rare but serious complication of pancreatitis is called infected pancreatic necrosis. This complication occurs if a part of the pancreas dies (“necrotizes”) and becomes infected with bacteria. It usually starts in the second or third week after pancreatitis has developed and is very dangerous because it can provoke an inflammatory response referred to as SIRS (systemic inflammatory response syndrome). In SIRS, the inflammation spreads from the pancreas to the entire body. The first warning signs include a fever or low body temperature, a drop in blood pressure and a faster heart rate or breathing rate. SIRS can cause organ failure in one or several organs. To find out whether you have pancreatitis, the doctor will first feel your abdomen (belly) with their hands. They will also ask about various risk factors for pancreatitis, such as alcohol consumption, medication use and possible signs of gallstones such as cramp-like upper abdominal pain (biliary colic). They usually take a sample of blood and will likely also do an ultrasound scan. If you are diagnosed with pancreatitis, you will be referred to a hospital. The symptoms of pancreatitis can also be caused by other medical conditions, such as an inflamed gallbladder, a heart attack or a gastric perforation from an ulcer. Various things are measured in the blood sample, including the lipase levels in the blood. Lipase is an enzyme that is made in the pancreas and usually flows into the intestine. Abnormally high levels of lipase in the blood are a sign of pancreatitis. The presence of certain other substances in the blood can be a sign of a blocked bile duct. An ultrasound scan of the belly is usually enough to tell whether gallstones are the cause. If an infection has led to changes in the pancreas, they can usually be seen in an ultrasound too. Sometimes more testing is needed. For instance, magnetic resonance imaging (MRI) can be used to create a picture of the bile ducts and any gallstones. Another option is to use an endoscope to look for gallstones in the bile duct. This involves pushing a flexible tube with an ultrasound device at the end of it into the duodenum through the food pipe (endoscopic ultrasound). A computed tomography (CT) scan can be used to detect complications such as necrotizing tissue and to get an idea of how the inflammation is developing. If the pancreatitis is associated with gallstones or a bile duct infection, endoscopic retrograde cholangiography (ERC) may be needed for the diagnosis. This also involves passing an endoscope through the food pipe and down to the bile duct opening in the duodenum. A contrast medium is then injected into the duct to make any stones that are there show up in the x-ray image. With the help of the endoscope, these stones can also be removed during the examination. But ERC exams involve exposure to radiation, and may cause various complications. Although there aren't any treatments that fight the cause of pancreatitis, there are a number of treatment options that aim to reduce the strain on the pancreas and relieve the symptoms. Because acute pancreatitis can cause fluid levels in the body to drop, the first step is to prevent dehydration by using an infusion (an IV drip). Medication can provide relief from pain, nausea and vomiting. Stronger painkillers such as opioids are sometimes needed, and they may make you feel drowsy or light-headed. To give the pancreas a chance to recover, solid foods are avoided until you feel better again and your appetite returns. In mild cases of pancreatitis, it is often possible to return to eating solid foods after just two days. If the symptoms last longer, artificial feeding may be necessary to supply your body with enough nutrients. If the pancreatitis is caused by gallstones, the stones may need to be removed soon using endoscopic retrograde cholangiography. After completing treatment for acute pancreatitis, the gallbladder is surgically removed to prevent relapses. Frossard JL, Steer ML, Pastor CM. Acute pancreatitis. Lancet 2008; 371(9607): 143-152. Johnson CD, Besselink MG, Carter R. Acute pancreatitis. BMJ 2014; 349: g4859. Moggia E, Koti R, Belgaumkar AP, Fazio F, Pereira SP, Davidson BR et al. Pharmacological interventions for acute pancreatitis. Cochrane Database Syst Rev 2017; (4): CD011384. Ockenga J, Löser C, Kraft M, Madl C. S3-Leitlinie der Deutschen Gesellschaft für Ernährungsmedizin (DGEM) in Zusammenarbeit mit der GESKES, der AKE und der DGVS. Klinische Ernährung in der Gastroenterologie (Teil 2) - Pankreas. AWMF-Registernr. : 073-025. 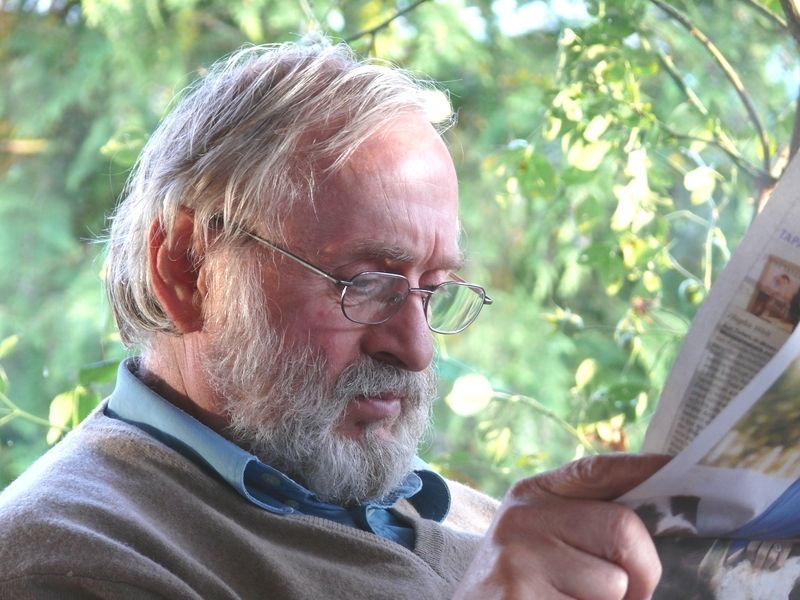 Aktuel Ernahrungsmed 2014; 39: e43–e56. Statistisches Bundesamt (Destatis). Krankenhausstatistik - Diagnosedaten der Patienten und Patientinnen in Krankenhäusern. December 11, 2017.